Boo Bash Returns to Spectrum Field on October 31, 2018! 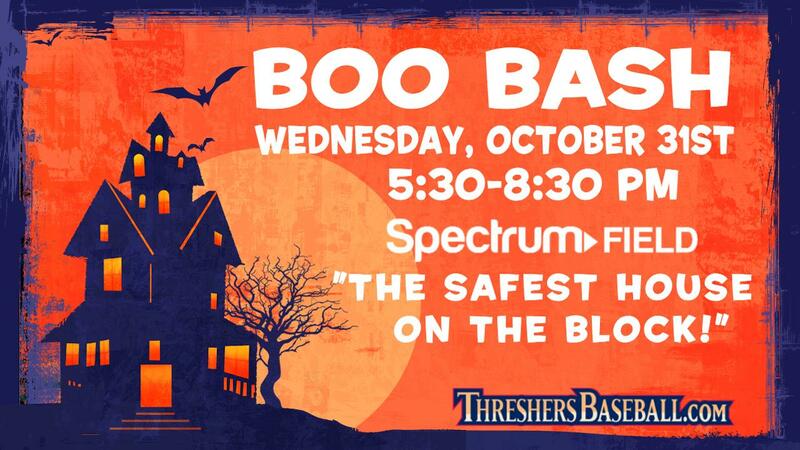 The Clearwater Threshers, the City of Clearwater, and dozens of local businesses and organizations will be passing out candy and treats at Boo Bash on October 31, 2018, at Spectrum Field. Boo Bash is a safe and family-friendly Trick-or-Treat event. Bring the whole family in costume for FREE candy, inflatables, the costume parade and on-field hayrides. Be sure to get your photo with and say hi to Phinley - the Clearwater Threshers mascot! Parking is free. The concession stands will be open with ballpark fare available for purchase. Boo Bash is not a pet-friendly event, but service dogs are always welcome at Spectrum Field.